If a horse does not jump properly, it does not win races. Because Pond House is equipped with the finest schooling facilities and staff money can buy, it is hardly surprising that we continually turn out more winners than anybody else. 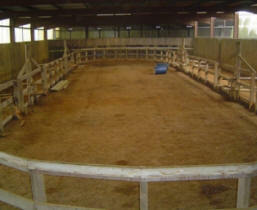 Situated inside our indoor canter, you will find the loose-schooling ring. 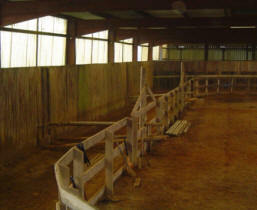 A horse will gain its first jumping experience in here, jumping riderless over small padded poles of variable heights. The poles are inviting to the horses, and encourages them to tackle the fences enthusiastically. 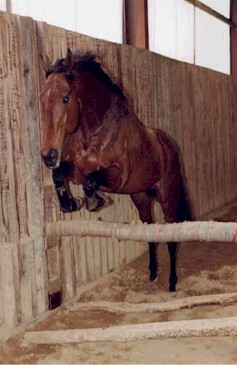 When we are confident in the horse's technique it will be ridden over the same poles until we feel it is ready to tackle some slightly larger obstacles. The horses then graduate to some bigger obstacles such as logs, barrels, and baby hurdles - the differing types of obstacles will keep the horses interested and willing to learn. The horses are given extensive sessions of schooling practice, and this groundwork is vital in making sure they are ready to tackle the real hurdles on the gallops, and finally the racecourse.